LOTEM is the leading organization in Israel offering outings, nature clubs and creative workshops in nature to people with special needs. With centers in Jerusalem and the north of Israel, LOTEM serves more than 30,000 participants every year. LOTEM's target population includes children and adults who are blind and visually impaired, deaf and hearing impaired, physically and intellectually challenged, emotionally disturbed, and at risk of physical and emotional abuse. Israelis are known for their love of nature. However, for 12% of the Israeli population, even a casual walk in the countryside is not always possible. People with physical, mental and emotional disabilities find it difficult to enjoy outdoor activities due to lack of physical accessibility or explanations suitable to their needs. In order to expose these populations to the wonders of nature, LOTEM is committed to providing accessible and suitable educational nature activities to as many people as possible every year. LOTEM serves adults and children from age four to senior citizens. Participants include people who are blind or visually impaired, deaf or hearing impaired, physically or intellectually challenged, and emotionally disturbed. In addition, LOTEM serves at-risk youth and mothers and children residing in shelters for battered women, and organizes joint programs for Arab and Jewish children with special needs. LOTEM- Making Nature Accessible is a non-profit organization dedicated to bringing people with special needs closer to nature, LOTEM was established in 1993 after founder Amos Ziv hiked the Israeli countryside with a group of teenagers with visual impairments. This moving experience made him realize the importance of helping people with special needs maximize their enjoyment of nature through suitable guidance and more defined trails. LOTEM empowers children and adults with special needs around Israel through educational activities in nature and the outdoors. In 2002, JNF, LOTEM, and Hadassah Women collaborated to build an accessible trail through Nachal HaShofet in Ramat Menashe Park. This circular trail is enjoyed by more than one million people every year. It is Israel’s only completely inclusive trail—designed to offer the same experience to visitors of all ability levels—and the prototype for JNF’s Inclusive Parks initiative. Going beyond handicap parking and wheelchair-accessible bathrooms, inclusive parks help visitors with and without disabilities to enjoy the beauty of nature without unnecessarily disrupting the environment or segregating popuations with different needs. Features of the inclusive trail at Nachal HaShofet include easily legible signposts that make use of color, contrast, increased size, and Braille; audio equipment and aromatic plants that provide increased sensory experiences to those with visual impairments; curb cuts that allow wheelchairs to go off the trail when appropriate; and an improved return trail—with a gentle gradient and rest stops—that leads back to the parking lot. In recent years, the relationship between human beings and nature has received more and more recognition. “Time spent outdoors often acts as a therapeutic and care-giving process, and thus the dialog that exists between man and nature can strengthen people’s physical, emotional and spiritual well-being” (Burns, Dr. G.W., “Nature-Guided Therapy,” Philadelphia, 1998). Since its inception, LOTEM has dedicated itself to advancing this dialog between “man and nature.” By offering hikes, workshops and afternoon nature clubs to people of all strengths and abilities, the goal is to enrich their lives and heal both their bodies and their souls. 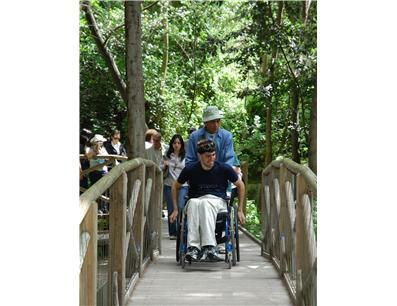 A glance at the smiling face of a wheelchair-bound child “hiking” through a nature reserve, of a mentally-challenged adult listening to a lecture suitable to his or her cognitive abilities, or of an emotionally-challenged man or woman participating in a task-centered workshops, is proof enough of the healing powers nature has to offer. Becoming a bar/bat mitzvah is a significant moment in the life of a Jewish boy or girl. Through our Mitzvah-to-Mitzvah program, children will have the opportunity to add more meaning to this event by sharing it with boys and girls in Israel who are less fortunate than them. By choosing to donate a percentage of their gifts to LOTEM, bar/bat mitzvah youth will give the gift of nature and the outdoors to a child in Israel with special needs of the same age. Participants in the Mitzvah-to-Mitzvah program will receive a certificate after completion of their mitzvah project. They also have the opportunity to join a tour with LOTEM when they visit Israel, together with their family.